Meet me: Karen — mm...Yoga! And wearing rainbow socks, because: rainbow. What keeps you teaching yoga when you are an economist by trade? I remember the day when I was still an economist, looking at my colleagues and seeing this sparkle in their eyes when they looked at graphs of financial markets and the passion with which they spoke about inflation, forex, the yield curve, none of which I felt similarly about at all. But that passion and sparkle I found shortly after I starting teaching yoga. 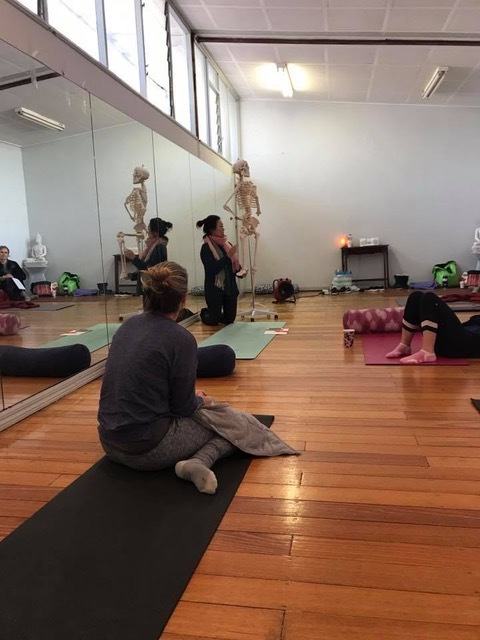 The joy it brings me to see my students discover something new about their bodies, learning a new way to move, or correcting a habit and returning to tell me that a pain that they’ve had is now gone - that joy and reward is indescribable. In a culture where we are always looking for more efficiency, a side effect is that we now move less, live more in our heads and less in our bodies, and I really like to use yoga as a tool to inspire people to move more and have less pain, and training other teachers who will hopefully do the same. What’s the most fun part of this job? Meeting different individuals, and learning for myself as well how we are all so different and unique, in the way we move, in the way we experience movements and sensations in our bodies. I also get to see a lot of Melbourne because I travel everywhere, I get to see the city, amazing office spaces and beautiful homes. Not sure if I’ve figured out a plan for when to eat still. I’m mostly teaching during mealtimes, and often teaching in the evening when I would otherwise be eating. So often I find myself eating way too late at night, or eating on the go, which I feel my body isn’t totally happy with! What’s your spirit animal & why? Just like a cat I can be pretty stealthy and sneaky - ask anyone who thought my class was easy then had trouble with stairs the next day! Oh and they’re bendy! Just like me. Where can you be found when you’re not running mm…Yoga? Well there ya go, me interviewed by...me. A tell-all tale! Older PostBig News, Big Changes!